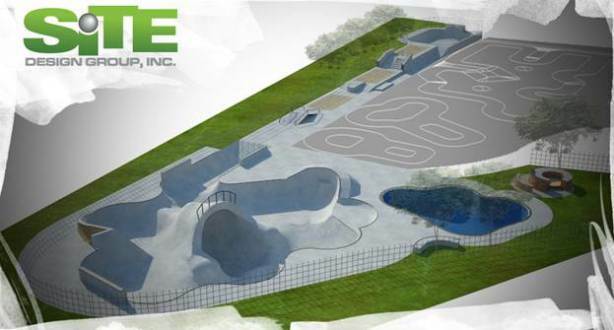 A Rendering of the new Etnies Skatepark of Lake Forest. Final Expansion Will Make It the Largest Free Public Skatepark in the U.S.
On February 10, 2011 the Etnies Skatepark of Lake Forest officially broke ground on its 16,000 square foot expansion project. Adding a variety of new features, the $1,000,000 expansion will set the etnies Skatepark of Lake Forest at about 60,000 square feet, making it the largest free public skatepark in the U.S. and one of the largest in the world. The park which is owned and operated by the City of Lake Forest offers year round classes, camps and special events and is the only public skatepark in California that offers BMX sessions. The etnies Skatepark of Lake Forest was a first in skateboarding – In 2003 it was the first time a skatepark was created through a public/private partnership. etnies partnered with The City of Lake Forest to create this skatepark that currently has more than 1,200 skateboarders ride it each week. Eight years later, the skatepark continues to be such a benefit to the city that they are expanding it. The etnies Skatepark of Lake Forest model shows that skateparks can be a major benefit to communities all over the world. The etnies Skatepark of Lake Forest will remain open as much as possible during the expansion. To keep up with the construction details or for more information on the etnies Skatepark of Lake Forest, visit etniesskatepark.com or call the park at (949) 916-5870. For updates on etnies and its skate team, visit etnies.com.